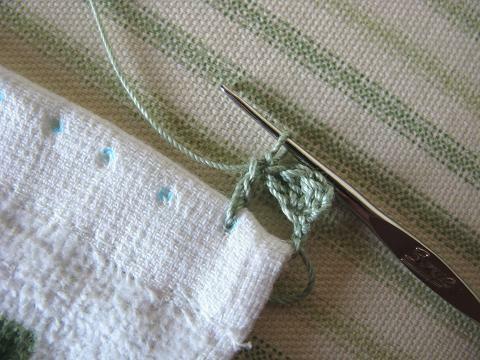 Crocheted thread edging can add a beautiful heirloom-quality to so many articles in a hope chest. 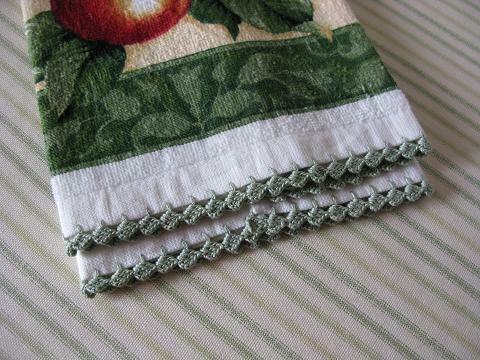 This simple crocheted edging is the perfect embellishment for ordinary kitchen towels, pretty printed sheets or plain white pillowcases. 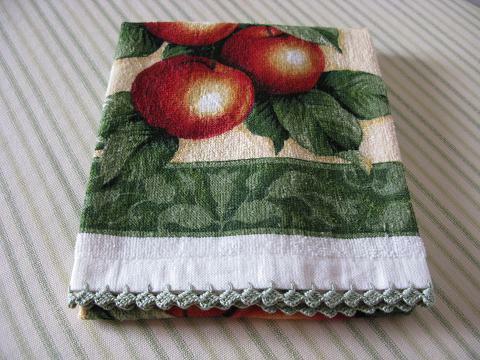 It looks lovely on washcloths and tablecloths and even a baby’s burp cloth. It is so easy and fast. The kitchen towel in the picture was completed in about 30 minutes! The stitches used in thread crochet are the same as for yarn, but the thread and hook are both much smaller. 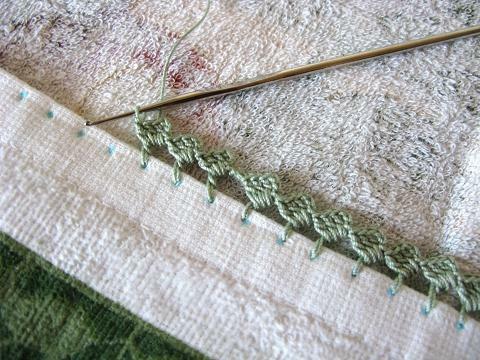 If you have never worked with steel hooks and cotton thread, don’t be afraid to try! If it’s been a while since you’ve crocheted, you may want to practice first with yarn until you are comfortable making the basic stitches. 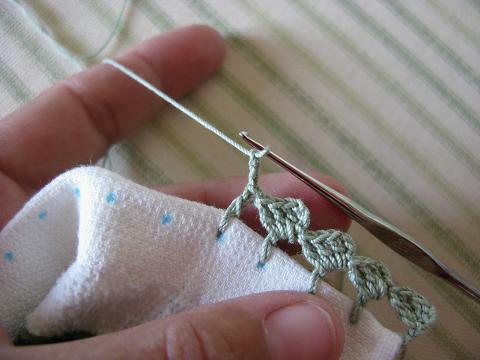 Then try a “finger”weight yarn or a size 3 cotton thread with a small hook until you get used to using the tiny hook with thread. Try to be patient with the initial clumsiness. It won’t last long, I promise. To begin, if you are right handed, grab the thread with your left hand pinkie finger and loop it around the finger. 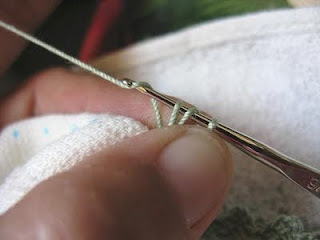 Then loop the thread over your left hand index finger and grip the slip knot between the thumb and middle finger. 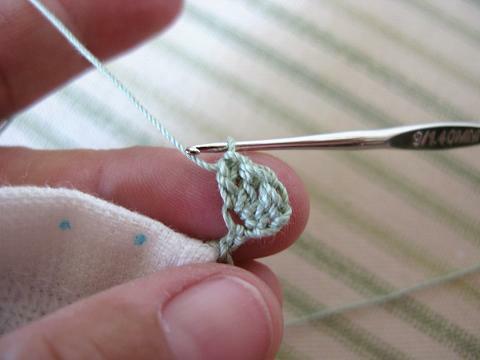 As you crochet, you will work with the section of thread that is between your index finger and the hook. 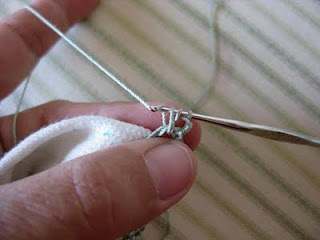 Make sure the thread will move smoothly through your fingers. This is called tension. In the beginning, finding a comfortable tension is a bit of a challenge. 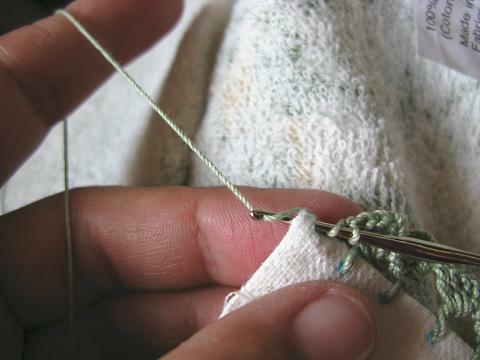 I like to wrap the thread twice around my pinkie, and sometimes I gain extra control of the thread, temporarily, by wrapping it twice around my left index finger, as well. 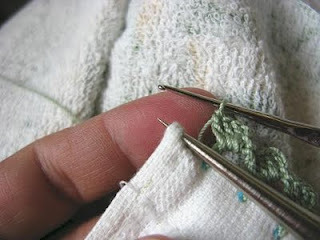 The process is really much the same as using larger yarns and hooks, but the thread feels quite different in your hand. You’ll hold everything quite the same as you do a larger hook and yarn, but don’t be afraid to experiment with something different. It is quite common to pull the stitches too tightly as you first work with thread. 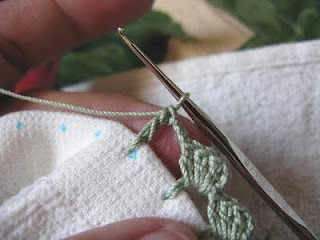 Concentrate on working relaxed stitches and try to make them even. 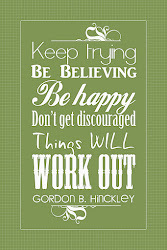 Don’t be discouraged with your first efforts. It takes some practice, but soon you’ll be putting lace on everything! To embellish the edge of an ordinary kitchen towel, you’ll need these materials: A towel, size 10 cotton crochet thread (you can also use Perle cotton, which is a kind of twisted embroidery thread), a size 7 or size 9 steel crochet hook, an embroiderer’s awl (to punch a hole), a washable marking pen, and a ruler. Push the awl through the fabric at the edge of the towel to make a tiny hole. 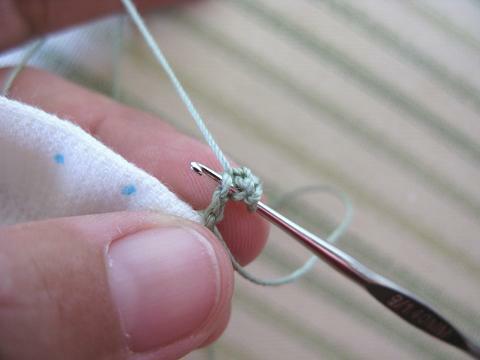 Pull the thread through the hole and make the first slip knot. Chain five. In the fourth chain from the hook, make a double crochet. Make another double crochet and then a third double crochet in the same space. 3 dc along with the initial ch 3 = 4 stitches in the cluster. 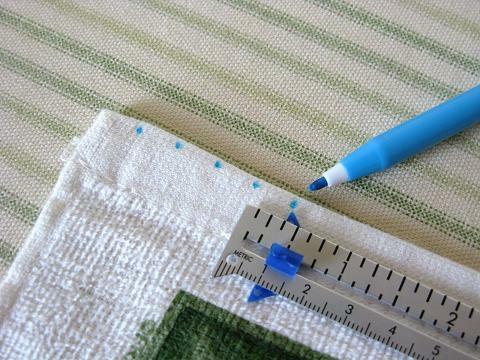 Use the embroiderer’s awl to punch holes in a few of the marks. I usually do eight to ten holes ahead of my crochet. If I do too many at one time, they simply pull together before I can get to them and then I can’t find the hole. So, I’ve learned to do just a few at a time. In the next hole, make a double crochet. This forms the “post” of the stitch. Chain three. These chain stitches form the “rise” of the cluster. Working over the post (the previous double crochet), make a double crochet. In the next hole, make a double crochet. Again, chain three to form the rise. Continue across, using this pattern: (dc in the hole to form the post, ch 3, 3 dc over the dc “post”). Every few stitches, stop and look for any mistakes. 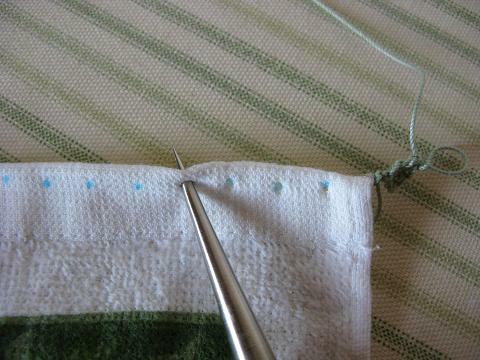 When you get to the last stitch, make a hole near the edge. Instead of a double crochet, form a half-double crochet for the last post. Chain three as usual. Make 2 dc over the post. Then, make a final half-double crochet for the last stitch. Clip the thread about 4 inches from the hook. 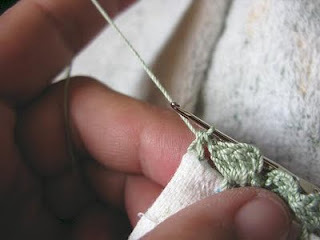 Make a yarn over and pull the thread through the loop to fasten it off. Using a half-double crochet in these last stitches will make the cluster lay just a bit tighter against the edge. Doesn’t it look pretty! Now, do the other end of the towel. You can do just one end. Sometimes, if I'm in a real hurry with a gift, I will do just one end of a towel, but I think it looks nicest to do both ends. 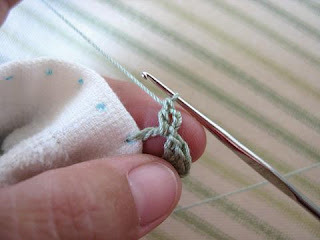 Weave the end of the thread (both ends) into the stitches and clip. After weaving through a few of the stitches, I sometimes push the needle into the hem and pull the thread a little way into the hem before I clip it off. I sponge the towel to wash the markings away and “block” the crocheted edge with steam from the iron. Then I fold the towel and it’s finished. The following pics show one of my common mistakes. If I get distracted or have to stop and pick things up again, I sometimes mistakenly do a chain three after I finish a cluster. Then I proceed to make another post in the next hole and continue. You can see the gap in the stitches when I make this mistake. It is easy to just pull it out back to the mistake and then continue again. As I work with the thread, I find it easier to sort of “lay” the stitch over the pad of my finger as I pull the thread through. This helps me keep the stitches even. 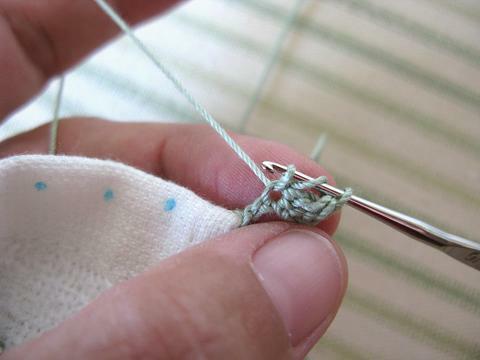 If you are having trouble with the stitches being too loose, it may help to move your fingers to pinch close to the hook as it slides through the thread to complete the stitch. One final tip. Because I do so much marking, I made a cardboard marking aid, with a row of marks at 3/8-inch and a row of ½-inch markings. I find this quicker than using a ruler. I hope these instructions are clear and that you find this edging as useful as I do. Please leave a comment if you have any questions. If you like the Zig-Zag edging, don't miss my other tutorials located under the crochet edgings label on the sidebar. This "Garden Fence" edging is one of my favorites! Would this edging work on baby blankets too? i suspect no one has answered this question because its obvious! do this edging on ANYTHING! Thanks for the step by step instructions. I would like to do this so hopefully the will to do it will aid the skill to do it. They are gorgeous and would look great on baby blankets and burp cloths too! I've bought a little hook and crochet string ~ I think I will try it on a coaster first! Thanks for such a detailed tutorial! Such a simple addition makes a big difference. Beautiful! Ladies, you make me smile! Thanks for your comments. Betty, this edging works great on baby blankets! Wonderful work and thanks for sharing your tutorial! Thank you for such a clear, concise, step-by-step! Such a great tutorial of a very pretty idea. This is a great tutorial! I've been wondering how to do the little holes. Didn't ever realize that there was something called an embroiderer's awl! Thank you! I'll be doing this for some blankets for my expected first grandbaby! You are all very welcome, I'm so glad the tutorial is helpful. Tina, I had to ruin several crochet hooks trying to push them through the fabric before I got serious about finding a tool to help me. The embroidery awl is a tool used to create eyelets in embroidery and I'm sure there are probably other applications. There is some fabric that is woven loosely enough that I don't have to punch the holes, but I almost always have to use it on tightly woven fabric like towels. Because the awl is so sharp, if you push carefully between the fibers, you won't break too many threads and the fabric will come together smoothly after a short time. If you use something not quite as sharp, you risk breaking more threads in the fabric. Making holes with the awl is also much easier on my fingers than trying to punch through with the hook! Thank you so much for sharing such a nice tutorial on crocheting. I'm new to crochet thread. I'm hoping to add some lace onto my pillow cases. But before that may I know what size of perle thread is equivalent to a size 10 cotton thread? The hooks size is 1.4 mm for size 9 and 1.65 mm for size 7? 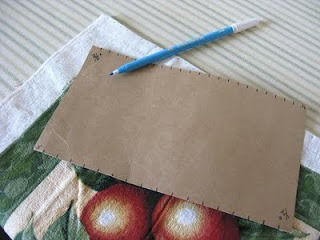 What other alternative can I use to punch the holes if I do not have any embroiderer's awl? Lynn, perle cotton is a twisted, 2-ply thread. It usually has a high sheen and is sold in five sizes, the smaller numbers are thicker than the higher numbers. Size 3 and 5 are both suitable for thread crochet, use either the size 7 or the size 9 steel hook, whichever seems to work the best for you. 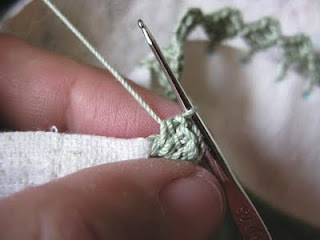 (If you keep dropping the stitch, try switching to the bigger hook.) Size 8 perle cotton is close to a size 20 in crochet cotton and is often used for tatting. Size 12 and 16 perle cottons are extremely fine and more suitable for embroidery. 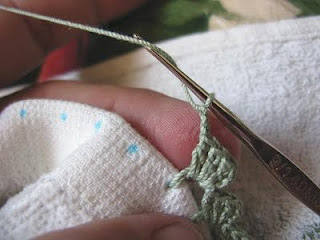 I generally use regular crochet cotton for thread crochet. But, one advantage of perle cotton, as opposed to the regular crochet cotton, is that it comes in so many more colors. It turns out to be, generally, more expensive, but sometimes it is worth the price to gain the color advantage. I'm not sure what to tell you to substitute for the awl. I used to use my finest steel hook to punch the holes, but I was always pulling threads on the way back out and constantly bending or breaking the hook. The awl makes things soooo much easier. I bought my Clover brand awl at a JoAnns Fabric Store, and I've also seen these tools in stores that sell sewing machines - check the notions wall. You might try a regular ice pick, being careful that you don't punch too big of a hole. Jo, you might not have to wait to try the thread crochet on washcloths. 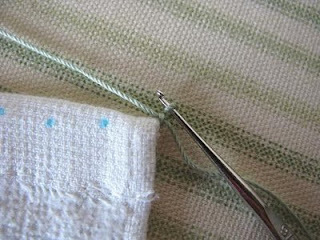 Some washcloths have a woven hemmed edge and you may need the awl for this type, but many washcloths have the more common serged edge, and the terry cloth is probably loose enough to push the small hook through without punching a hole. Washcloths are a great application for this project and "Grandma" crochet is the best kind - sentimental satisfaction. That is really pretty! What a nice and cozy touch. I just clicked over from Craft Gossip and I'm so glad I did. I love new-to-me blogs with fabulous crochet how-tos! I would love to link to your project if you didn't mind. This is so beautiful. I really want to give it at try. These are great instructions, Kathleen. 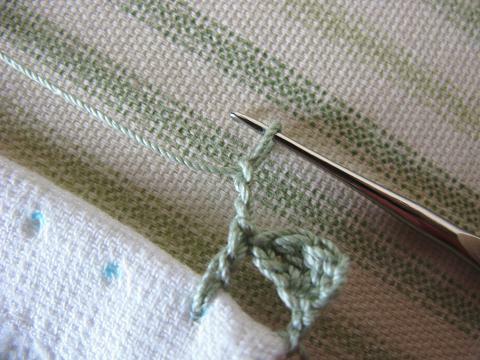 I've seen crocheted edging on baby blankets, tried on myself and it worked okay, but I think the use of an awl would make it so much easier. So pretty! I love the thread you used. I've edged some baby blankets but no towels yet. 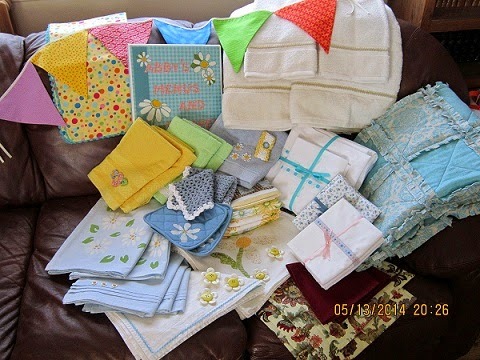 I'm always on the lookout for crocheted and tatted towels and pillowcases when I hit garage sales. Sometimes the item is stained or torn but I know the work that went into the edging so I frequently end up buying it, especially when it's an estate sale and I know it might end up in a landfill! 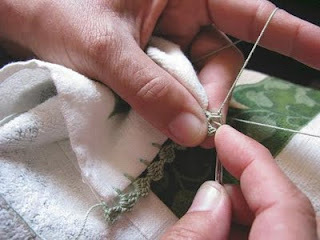 Hello Kathleen~ I am delighted to have found your blog through Primrose's~'Stitchery School' site. This is so exciting to me since I have my Nana's and my Great Aunt Esther's crochet tools.....awl included! Those teeny, tiny crochet hooks enchanted me as a child and now I have great instructions on how to use them. I will enjoy following you as you share other projects too. Welcome Carolyne, I am as delighted that you have found me and hope you'll continue to leave comments. 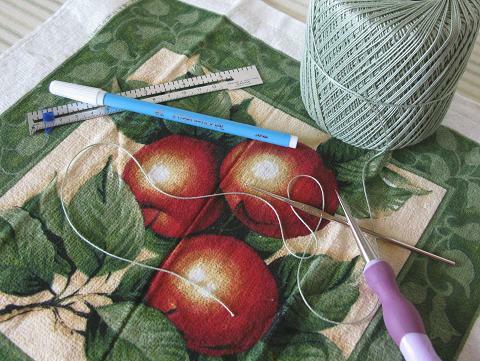 I'm glad this pattern can help you get started with those heirloom tools. What a treasure to have them! I found you through a Pinterest Pin. 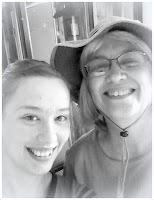 Your blog is amazing! All these years of crocheting edging and sewing it on, or first edging with blanket stitch then crocheting the edging by picking up the stitches...how could I not have heard of an embroiderer's awl? Thank you so much for sharing this tutorial! You have revolutionized my world! I just found your blog through Craft Magazine because I thought this edging was just beautiful. As someone else asked before, I was wondering to do a baby blanket with a crocheted edging. However, I'm not sure how to proceed when doing the corners... :S Could you provide me with some "light" about this? Nur, welcome! I'm glad you found me, and I'm glad this tutorial is helpful. Concerning the corners...if the corner is curved widely, just procede normally. 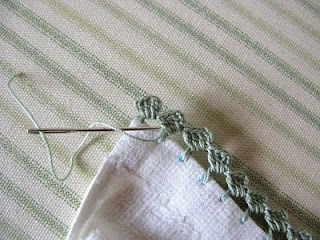 If the corner is curved tightly, just place the stitches closer together as you go around the curve. If the corner is squared off, I would put three double crochet "posts" in the same hole, in the corner, and make the turn that way. If you have made the blanket, instead of purchasing it, I would try to round the corners, at least a little, before starting the crochet. This is so lovely! Thanks for the tutorial! Beautiful! Love the tutorial and love the idea of making a marking template...you're right, much quicker if intending to do a few...which I am! thank you so much for this! I cant wait to do some towels for my daughter! Thanks, this is great. I pinned it on Pintrest and am about to trim a scarf with it.... Lovely! Thanks, I have seen this edging and wanted to do it but didn't know how to. That is so beautiful! Thank you for the wonderful tutorial. I can't wait to get started on some lovely tea towels for Christmas gifts for my co-workers. Thank you so much for this fun and clear tutorial. I haven't read through much of your blog so I'm not sure you've already said this but when I'm crocheting around a baby blanket I punch my holes using a wing needle on my sewing machine and the blanket stitch. I also like to crochet around fleece blankets and use an awl I grabbed from the hardware department (it was a lot less expensive than the one in the fabric department.) I think this stitch will be perfect for my fleece blankets. Thanks again! Thanks for all these sweet comments. There has been so much interest in this tutorial and I'm pleased that it has been so useful. Carol, I actually have tried to use a wing needle and the technique works pretty well on the flannel baby blankets. The one thing that I especially like about this edging is that it skips a foundation row altogether, saving a bit of time. Nice, huh? Thanks for the tip about the hardware store. Good idea! Huge thank you for sharing this. I've wanted some crochet edge trimmed pillowcases and can hardly wait to try it! I love this crochet edging! I am a young girl and this is the first project I made for my hope chest as well as the first project I have ever done with crochet thread! At first I was clumsy, but once I got used to the "tinyness" of the thread, I really enjoyed it. Now ordinary yarn seems so bulky and clumsy! I added the edging to two beautiful hand towels. Funny though, because of a combination of not being able to find an awl at Jo-anns and a desire to save money after buying the towels, threads, and hook, I ended up using a thumb tack! I liked it so much after awhile I never went back to find the awl, and if I am careful I don't rip any threads. I love the premise of your blog. I found you through pintrest. 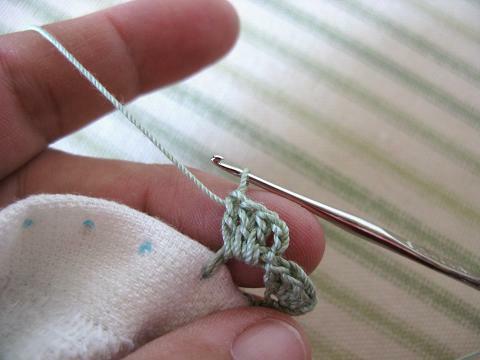 I actually prefer to crochet with thread and am eager to try this. Can't wait to look through your blog a bit. Super tutorial!! Thanks so much for posting this. I've been wanting to do this on pillow cases for a while. Gracias por el tutorial, la punta es muy bonita. Are you using American terminology? This looks like an Aussie treble (American double crochet) to me....wouldn't it be nice if the crochet terminology was the same world wide? Love the instructions and the end product!! Your teaching was perfect. It's a beautiful work. Thank you for sharing! I just stumbled on your website and I love it, love it, love it! Your instructions are so easy to follow, and your projects are so doable! Thank you for sharing your talents with all of us! Thank you for the lesson, il will publie your link on me blog! Have a good day ! I enjoyed reading it. I require to study more on this topic. Thanks for sharing a nice info. Anyway I'm going to subscribe for your feed and I hope you post again soon. Thank you for the lovely pattern and clear and easy to understand instructions. Your edging looks really pretty. I like to crochet around washcloths and cotton dishcloths. So far, I've just made up a pattern that forms a kind of scalloped edge. I really like this one, and I think I'll use your design from now on. Especially since it works up so quickly. My mother-in-law embroiders flowers on the ribbon weave section of washclothes and sells them at craft sales. She just makes three or four simple daisy-type flowers that match the edging; usually on a white washcloth with a serged edge. People love them, and so do I. Also,I didn't know about using an awl to poke the holes. I've been using the metal crochet hook with varying degrees of success. Thank you again. There is something so satisfying about pretty handmade things that help to counter-act our made in China/Wal-Mart world. It does look very easy! I will be trying this, thank you so much for sharing. I am happy to follow you and look forward to more crochet posts. Have a great night. Oh my goodness, thank you. I just used this to finish a baby blanket and your tutorial is fantastic! I see someone is going to do this to a curtain edge... Fabulous idea! Thank you for the tutorial, most especially the pictures. My great-grandmother used to make wash clothes in to pot holders and I could never figure out how to get my hook through the layers. Using the awl should fix that. I do primarily doilies with a size 20 or 30 thread and occasionally love to use the larger sizes. I'm looking forward to looking through your blog for more ideas! What a beautiful way to finish off a tea towel, it looks so pretty! I have this linked to my crochet post as well today, it's a roundup of crochet projects in home décor! THank you for posting this pattern. Came out beautifully on washrags as well. I love your dish towel.. I just found your blog and must say I love your profile statement. I thought I was only surviving person who cared about hope chests! I am 31, got married at 22, and my husband was definitely happy I had been squirreling things away for a few years prior! Some things I made, some things I grabbed on deep sale. When we moved in together as newlyweds, there wasn't much left to buy! Hi! I was wondering if this would work on the sleeves and hem of t-shirts. I find that t's made for women are just too snug and if you go up a size they look funny, and men's t's look like men's t's even if they are in a girly color. I want to "girly" up my men's t's with this technique, and I was wanting your opinion on how well it would hold up with washing and such. I think it would be so cute. I just love your blog, and your instructions are second to none!! Hi back, Geri! This edge would look very cute on a tee, but remember the stretch problem. 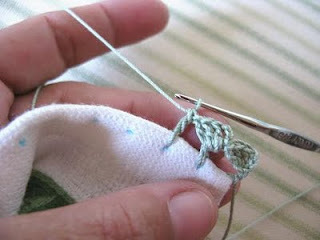 The cotton thread won't allow the fabric to stretch once you get it crocheted onto the hem. If your hem or sleeves don't need to stretch around your arms or hips, you'll be fine. It washes well. I'm sure it would hold up to wear and washing. This is such a lovely and clear tutorial. No questions at all. Clearly understood. May god almighty help you to produce more of this sort. Love this!! One question. I went onto Amazon to look for an awl, and I was wondering if an Embroiderer's awl is the same thing as a tailor's awl. Is there something special about an Embroiderer's awl? Thanks so much!! 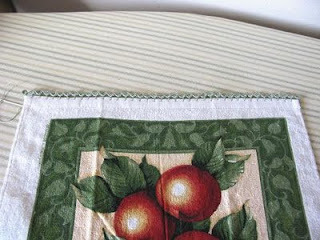 MY MOM MADE THESE WHILE WE WERE GROWING UP I ALSO LEARNED HOW TO CROTCHET THEM ON DISH TOWEL'S BUT NEVER DONE THEM ON PILLOW CASE LOVE THAT IDEA ALSO WE DIDN'T USE THE AWL WE USED, THE NUT CRACKER THE STRAIGHT ONE FOR TAKING NUTS OUT WORKED BEEN DOING IT FOR 15 YEAR. WELL GOING TO BUY SOME THREAD AND TRY THE PILLOW CASES THANK YOU FOR THE IDEA. Excellent tutorial! Thank you for sharing your knowledge. lot time I had spent for this information! 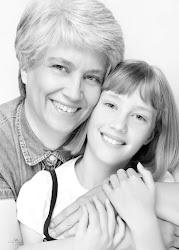 Hi to all, it's truly a nice for me to visit this site, it consists of precious Information. Very pretty edging and great photos! Thank you! Just finished one of these using your tutorial. Thanks so much! I don't have an embroidery awl. I use an ice pick. Works like a charm. Cant wait to try this! Thank you for sharing! Se puede traducir al español? Fernanda -use the google translate button at the vey top of the sidebar. I just purchased a new crochet hook called the Edgit that's has a sharp tip rather than a rounded one to pierce cloth and crochet your foundation stitches in one easy step. 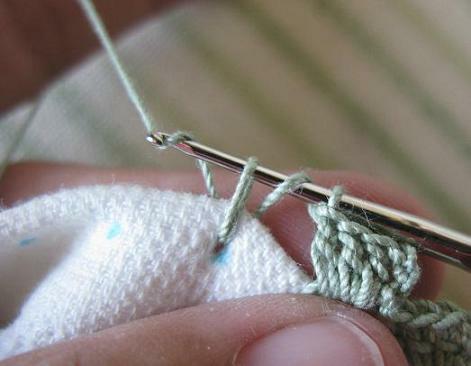 You then continue with a regular crochet hook for the rest of your pattern. Kathleen, thanks for sharing your wonderful projects and crochet wisdom! In reality, the awl is just a tool to pierce the fabric and then push it apart, hence the sharp tip and the wedge shape. I used to use an awl that had a sharp tip, but was shaped more like a nail - it straightened out right away. I had to be more careful with this tool, since, if I pushed too hard I would push past that initial wedge and then the whole thing would slip through the fabric, creating a bigger hole than I really wanted. If I'm reasonably careful, the wider wedge on this bigger tool stops my push before I push too hard, if you can imagine what I'm talking about. 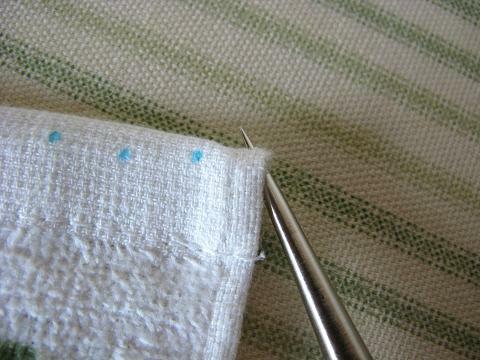 A sharper tip will pierce between the fibers of the fabric and push them apart, rather that breaking the fibers. Any tool with a sharp tip has the potential to do that, so you could theoretically make any awl work. If you can see that the threads are breaking, then the point may not be fine enough. An ice pick works in a pinch, so I would bet that a stiletto awl will work as well. I looked at an example on the UK amazon and it looks just the ticket. I would give that a try. This is exactly what I've been looking for! I found you today through Pinterest, and it's such a clear and detailed tutorial that I'm sure I can do this. Thank you so much! Thank you for wonderful tutorial. Thank You so much for a wonderfully detailed instructional post! I'll definitely be adding this edge to my custom tea towels from now on! You're very welcome Laurie! Happy to help.